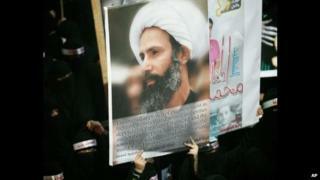 A court in Saudi Arabia has sentenced the Shia cleric Sheikh Nimr Baqir al-Nimr to death, his family says. Sheikh Nimr Baqir al-Nimr's brother said he was found guilty of seeking "foreign meddling" in the kingdom, "disobeying" its rulers and taking up arms against the security forces. The cleric was a vocal supporter of the mass anti-government protests that erupted in Eastern Province in 2011. His arrest two years ago, during which he was shot, triggered days of unrest. Oil-rich Eastern Province is home to a Shia majority that has long complained of marginalisation at the hands of the Sunni royal family. Protests began there in February 2011 after the start of the pro-democracy uprising in neighbouring Bahrain, which has a Shia majority and a Sunni royal family. The Saudi authorities deny discriminating against Shia and blame Iran for stirring up discontent. Sheikh Nimr's brother Mohammed said on Twitter that he had been sentenced to death by Riyadh's Specialised Criminal Court, which tries terrorism cases, on Wednesday morning. A statement by the cleric's family described the verdict as "discretionary", saying the judge had the option of imposing a lighter sentence, according to the Associated Press. It also warned that the trial had been "political" and had set a "dangerous precedent for decades to come". When Sheikh Nimr, who holds the rank of ayatollah, went on trial in March 2013 prosecutors called for his execution by "crucifixion", a punishment which in Saudi Arabia involves beheading followed by public display of the decapitated body. Human rights groups expressed concern at the time that he would not receive a fair trial. They also said he had still not been given access to adequate medical care for the gunshot wounds he received during his arrest in July 2012, something denied by the authorities. Police shot Sheikh Nimr in the leg four times in disputed circumstances as they detained him after a car chase in Eastern Province's Qatif district. Officials said he rammed a security forces vehicle, leading to a gun battle. However, his family disputed the allegation that he resisted arrest and insisted that he did not own a weapon. The cleric was held for eight months before being charged and reportedly spent the first four in an isolation cell at a prison hospital in Riyadh. Activists and relatives say Sheikh Nimr, who has a wide following among Shia in Eastern Province and other states, supported only peaceful protests and eschewed all violent opposition to the government. In 2011, he told the BBC that he supported "the roar of the word against authorities rather than weapons... the weapon of the word is stronger than bullets, because authorities will profit from a battle of weapons". His arrest prompted days of protests in which three people were killed. Human Rights Watch said more than 1,040 people had been arrested at Shia protests between February 2011 and August 2014. At least 240 are still believed to be in detention. "I think the message that Saudis are saying is: 'We will arrest anybody. We don't care how high profile they are... nobody is above this. We don't have any tolerance. We don't have any flexibility,'" HRW Middle East researcher Adam Coogle told AP after Sheikh Nimr's sentencing.